"During his 36-year career in the military he spent 13 years in the Delta Force, including two years as its commander, and was involved in numerous high-profile missions, including the 1980 Iran hostage rescue attempt, the 1992 hunt for Pablo Escobar in Colombia, and the Black Hawk Down incident in Mogadishu, Somalia." In 2004, he was reprimanded by the Pentagon for publicly explaining that the US military would win in Iraq because our (Christian) God is "bigger" than their (Muslim) God. He also characterized Muslims as Idol worshipers. He later intimated that our troops were fighting for Jesus in the War on Terror. Oh, and he said the true enemy of the United States was Satan. Not surprisingly, Boykin currently holds the position of executive VEEP of the Family Research Council, James "Focus on the Family" Dobson's collection of uber-Neocon, homophobic "Christian" conservatives. The ultimate soldier in the army of the Lord is making headlines again with his latest psychotic assertion that Jesus is coming back, but this time he's packing an AR-15. Seriously. He's not speaking metaphorically. Seems the Prince of Peace likes big weapons that blast the evildoers back to hell -- he's replaced the powerful swift sword with a military assault rifle. "The Lord is a warrior and in Revelation 19 it says when he comes back, he's coming back as what? A warrior. A mighty warrior leading a mighty army, riding a white horse with a blood-stained white robe ... I believe that blood on that robe is the blood of his enemies 'cause he's coming back as a warrior carrying a sword. And I believe now -- I've checked this out -- I believe that sword he'll be carrying when he comes back is an AR-15. Now I want you to think about this: where did the Second Amendment come from? ... From the Founding Fathers, it's in the Constitution. Well, yeah, I know that. But where did the whole concept come from? It came from Jesus when he said to his disciples 'now, if you don't have a sword, sell your cloak and buy one.' I know, everybody says that was a metaphor. IT WAS NOT A METAPHOR! You won't build my kingdom with a sword, but you're going to have to defend yourself. And that was the beginning of the Second Amendment, that's where the whole thing came from. And the sword today is an AR-15, so if you don't have one, go get one. You're supposed to have one. It's biblical." The second amendment came from Jesus. He's "checked out" Revelations and is certain Jesus is coming with an AR-15. 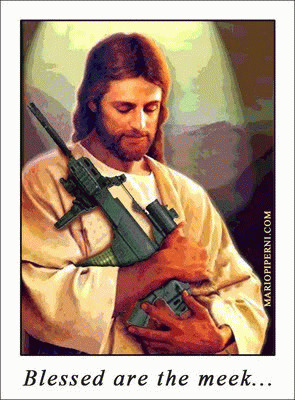 In fact, we should all get AR-15's so we can all shoot and maim and kill ... like Jesus. Kinda frightening to think how much power this guy wielded in the upper ranks of the US military. Makes you wonder if he took it as a personal mission to see how many non-believers (read: Muslims) he could send to a fiery hell so that Jesus would comeback, drenched in blood, like a Holy Dirty Harry, and finish the war on terror (read: Muslims) once and for all. Amen.